Do you need a new high-speed wireless router? 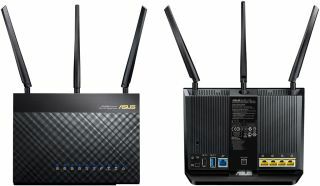 A smoking good deal on a rebranded Asus RT-AC68U that has been around since before Black Friday is still in effect. It is through T-Mobile, which is selling the the T-Mobile Wi-Fi CellSpot (as the rebranded version is called) for just $99. That's already a great price for one of the better routers on the market, though if you apply coupon code WIFI40, it knocks the price down to $59. Talk about borderline theft—the original model from Asus routinely sells for $150 at other vendors and is worth every penny. While this is a rebadged version that T-Mobile is selling, there are some features it lacks. According to CNET, the T-Mobile Wi-Fi CellSpot supports four guest networks instead of six. It also lacks the RT-AC68U's Dual-WAN feature that turns one of the four LAN ports into a second WAN port, in case you're dealing with two ISPs. Neither of those limitations seem like huge deals to us. One thing that potentially works in the CellSpot's favor is that it features T-Mobile's Evolved Packet Data Gateway (ePDG) technology. That's supposed to offer better Wi-Fi calling support, though we have not spent any hands on time with the rebranded model. Finally, note that the picture above is of the RT-AC68U and not the CellSpot. T-Mobile's version has some additional branding on the front, but we couldn't find an image big enough to use. In any event, go here if you want to take advantage of this deal.